Paint a smile on the faces of the closest people in your life by sending this Splendid Mixed Floral Bunch and Cadburys Dairy Milk Chocolate that carries the essence of the feelings for them straight from your heart. 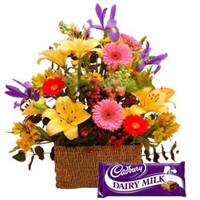 Exotic Flower Arrangement with a Assorted Cadburys Chocolate with 500 grms Assorted Sweets. Exotic Flower Arrangement with a Cadburys Celebration Chocolate Box. Exotic Flower Arrangementt with a Assorted Cadburys Chocolate with 16 pcs Ferrero Rocher chocolate box.